Moments of Adventure: 3 shows in 3 countries in 4 weeks !! 3 shows in 3 countries in 4 weeks !! 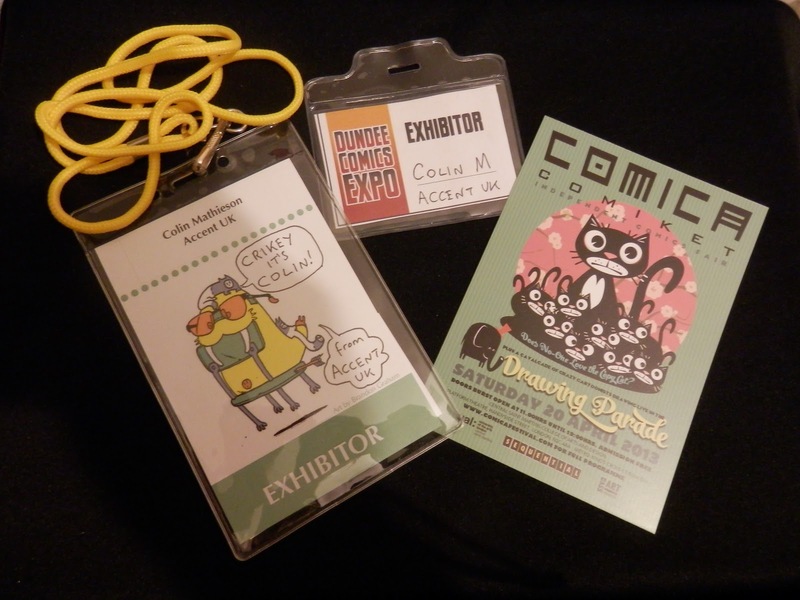 Dundee - New York - London - Colin strikes a pose around the comics world! Well after covering some 7,632 miles (according to Google maps!) 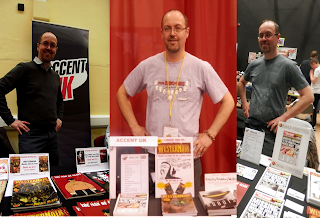 these last few weeks I'm finally surfacing to catch up on events after flying the Accent UK flag at Scotland's Dundee Comic Expo New York's MoCCA Festival and London's Comic Comiket - phew! 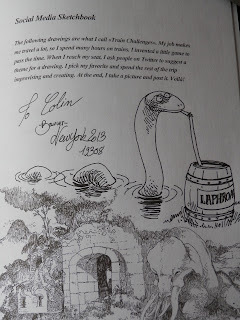 Not sure I've quite recovered, picking up some strange mid-Atlantic flu along the way, but almost there, so thanks to all those who've been in touch, much appreciated. I realise how lucky I've been to make these trips, see some great sights, meet lots of talented creative folks and of course indulge myself in comics, so can't complain really, tired or not! 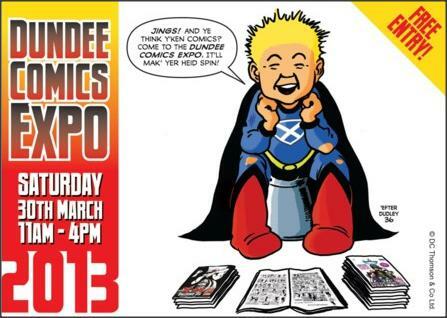 Dundee will always be the home of comics for me, not just because its down the coast from where I was born, but because its where the mighty DC Thomson are based! They were the mainstay of the British comics industry in my formative years and are still hanging in there with the Beano, new digital Dandy and of course the evergreen Commando, so it was a real thrill to take part in this inaugural show in a city which, despite my heritage, I hadn't visited in 30 years! 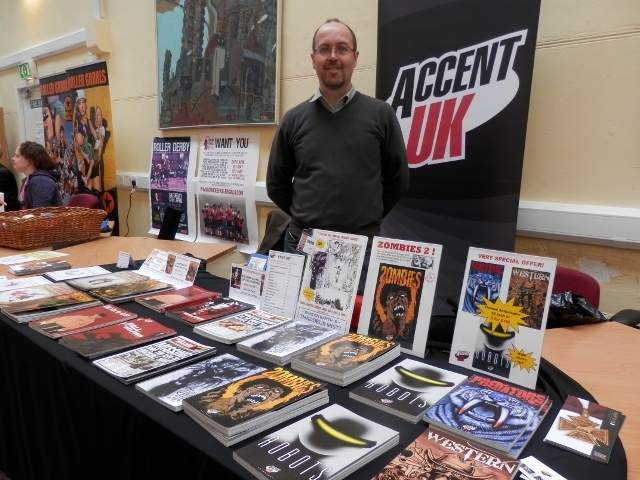 While this was its first Comic Expo, Dundee has recently held successful lecture & comic study days linked to the University's comics courses and the annual literacy festival with separate (and ongoing) Manga/Anime themed shows, so Dundee is quite a hotbed for comics events. 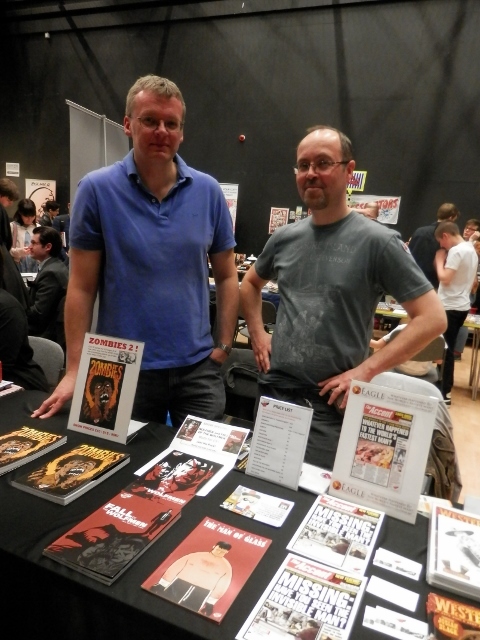 But being the first expo, organisers Dr Chris Murray and Phil Vaughan wanted to make it as inclusive as possible so tables and more importantly, admittance was free! They were rewarded with a fun wee show attended by some big names in UK comics including Bryan and Mary Talbot, David Lloyd, Nigel Dobbyn and Gary Erksine, the mighty D C Thomson and a good range of Scottish based indie creators and publishers including John and Sha from Black Hearted Press and Jim Alexander who I'd met before at last year's Mega-con show in Carlisle. Thanks to Nigel Dobbyn for taking this wee snap of our first ever Scottish show table display! 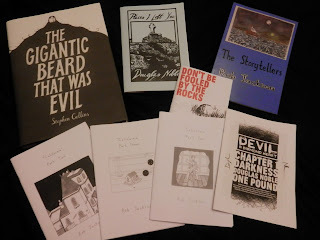 In fact, I needn't have been worried about feeling lonely on my first ever solo show as I soon encountered familiar names, if not faces including the wonderfully enthusiastic Joe Gordon of Forbidden Planet blog fame who I don't think I'd ever met in person before, despite communicating over the years. It was great catching up with him and discovering our shared interest in Sir Richard Burton (no, the other one!) 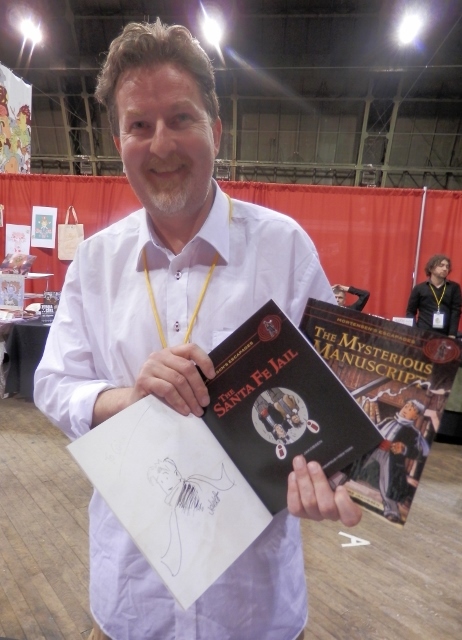 and I was pleased to do him a wee sketch and tickled that his friend snapped up my Zulu comics as my first sales of the day. Sales continued to be brisk in the relatively short opening times, (11 - 4), which made for an unusually quick day but also one where I discovered first hand the difficulties of exhibiting 'solo' - its darn tough, you have to do all the talking and you can't get out, you're trapped behind your table and can't go for the usual leisurely stroll round the rest of the show, let alone have a pee or coffee break!! 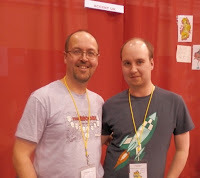 Obvious stuff but since Dave and I have always tabled together (usually with others), I didn't realise how tough it was on your own, so I hope poor Doug Noble forgave me for pouncing on him when he was enjoying a rare non-exhibiting visit to a comic show as I made haste for the bathroom. It was then that I discovered the whole other hall and corridor area full of more exhibitors & creators, including the afore-mentioned Bryan and Mary Talbot and Nigel Dobbyn etc which I hadn't seen at all. Perhaps this was for the best as bumping into Graham Neil Reid he recommended that I check it out as some chappie was apparently selling loads of old British comics original artwork which he knew I'd a softness for, but wisely I turned my back and gratefully let Doug escape to enjoy the shows programme of talks that he'd came for. So I finally experienced how awkward it was exhibiting on your own but was rewarded with decent sales and some great chats with interesting folk in a fun half-day or so. Difficult to say how many attendees there were, probably around 300, but enough to give a bit of atmosphere to the place and as a first Scottish show for the Accent UK range, I'd say it was a success. Congratulations and thanks to the organiser's, who I understand plan to return next year which is good news, allowing me to combine with a visit home to see the folks without risking too many brownie points! Actually an extra treat was catching up with my cousin David who I'd not seen in an age. He kindly joined me behind the table for the last hour or so and gamely didn't complain or appear too bemused by my antics - Comics n Cousins, whatever next!! 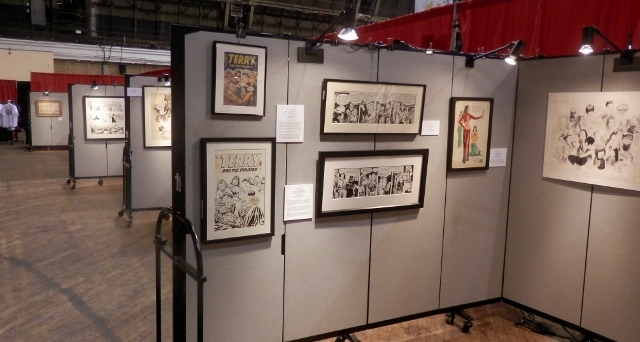 See Joe Gordon's comprehensive FP blog show report and his excellent flixr account for loads of pics, Jeremy Briggs, who I somehow managed to completely miss also has pics from the show here. Finally here's my obligatory haul photo, amazing really since I didn't leave my table for any of these but bought or traded them from where I stood, - see I'm learning! A mere 36 hours after returning from Scotland it was off to the airport and New York's MoCCA fest, exciting stuff! This was to be our third consecutive year exhibiting but sadly Dave couldn't make it this time leaving just Scott and I to do the honours. 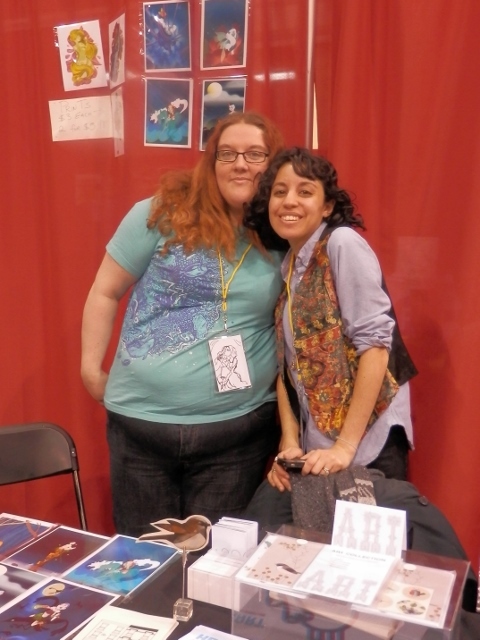 MoCCA is (I think) in its 11th year, but this was to be its first under the control of the respected Society of Illustrators, ('SoI') who had come forward when the previous committee had run into difficulties before and following last year's show. The SoI had impressed in their pre-show communications so we were cautiously optimistic about things, so how was it? Well they certainly made a fantastic job of 'tarting' up the venue, a large imposing regimental army hall, and 'tarting' is appropriate as behind all exhibitor tables were hung rather lovely red drapes like a large theatre or boudoir - although I kept thinking of Twin Peaks! However the drapes really worked to dress the otherwise cavernous venue, seperate out the aisles (which also sported new hanging signage) and dampen noise, so plus marks for that and the clever addition of a 'pop-up' art gallery of original comic artwork and a couple of cafes with small seating chill out areas, so far so good! 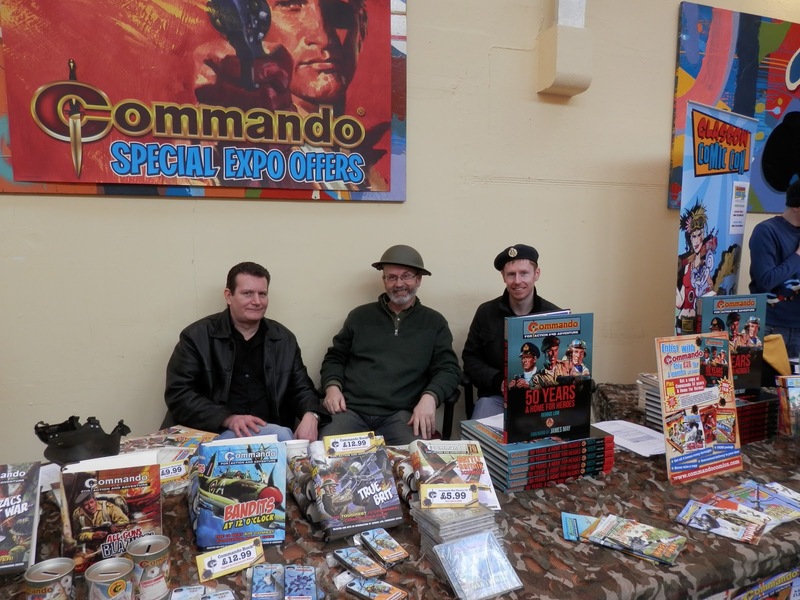 There was however a wee problem with the table layout as they had forgot to leave 'gaps' for exhibitors to come and go, meaning that you either had to run a mini gauntlet behind the tables or risk your dignity by crawling under the tables. Not ideal and its a shame that such basic issues are a regular occurrence at comic shows throughout the world, still after my solo stint in Dundee I wasn't complaining too loudly, as any route for freedom, no matter how narrow was very welcome! 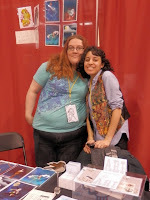 Cliodhna & Jasmine & those drapes! Me, Scott, & more drapes! Scott and I were fortunate to again find ourselves tabling alongside Cliodhna Lyons and her good chums, Jasmine and Chris Vollherbst, who after dipping their toes in exhibiting at last year's show returned with a very impressive array of creative goodies, well done folks! As we looked round the hall and exhibitors listed in the glossy programme, we were though struck by how few names we recognised from previous year's shows, bearing in mind that we are really still 'newbies' ourselves, there didn't appear to be that many long timers there, with the exception perhaps of indie publishers including, Abrams, Drawn & Quarterly, Fantagraphics, Fanfare/Ponent Mon, NBM, Top Shelf. 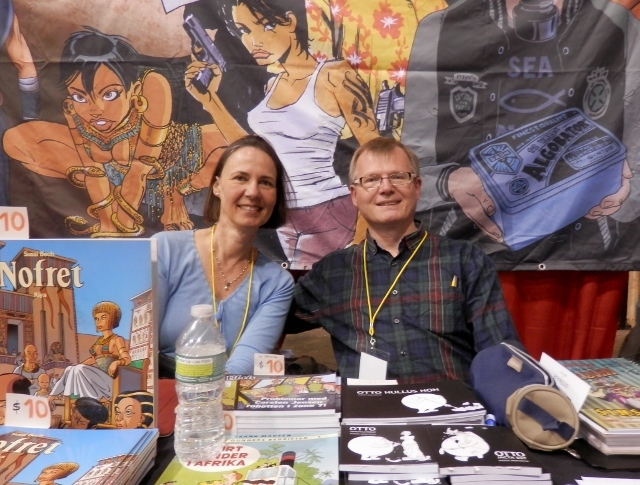 The 2012 show had clashed with Stumptown with many choosing it over MoCCA and perhaps, given the change in leadership, a good few had decided not to return. I may be wrong of course on this point but among the 300 tables, I didn't recognise that many faces? 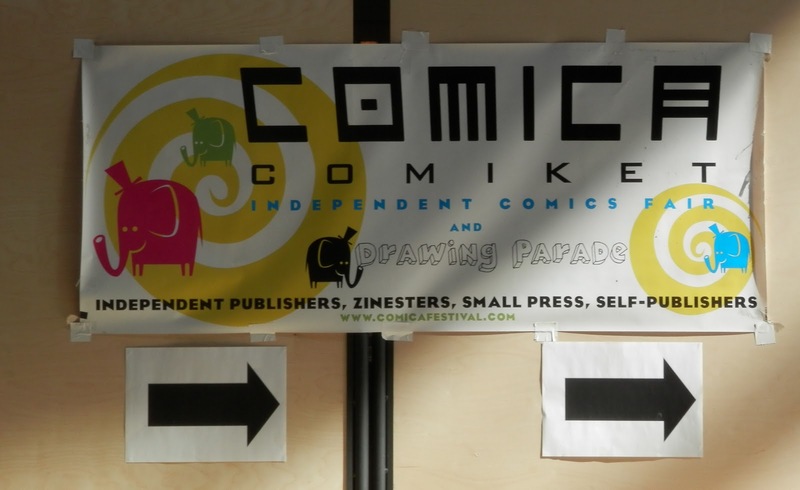 A welcome exception to this was the Danish Guild and Swedish Comics Association with their crew of friendly creators, many of whom we know from our regular trips to the bi-annual komiks.dk festival, now re-named Copenhagen comics and returning this June. It is always a delight to spend time in their company even if we are jealous of their Danish arts council funding which sponsors their trip! As the show progressed, there was a noticeable positive atmosphere and steady streams of people coming through the doors on both days, certainly feeling busier than last year which had been 'flat' at times. However very oddly we noticed that sales were slower than before, this despite the crowds and lots of attention, business cards, questions and good conversations etc. 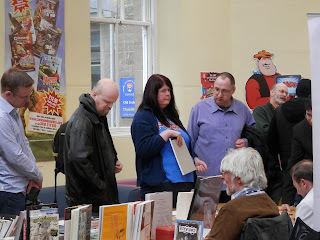 At shows the challenge is often to engage with folk to encourage them to stop and browse your books and, although I've never studied it, you may get a sale for every 3rd or 4th such person. This year the issue wasn't getting folk to look but to buy, with sales conversions maybe only every 7th or 8th browser? This was a little worrying and chatting to others seemed to be the general pattern (with one or two exceptions such as certain popular prints and Adhouse's Boulet 24 hour comic book which literally flew off the table), so it was sadly no surprise that our sales for the show ended up being down from the year before and well down from 2011, our first year, when we'd all but sold out of stock. Its difficult to fully understand why, we had lots of interest and repeat customers and sold copies of each book we'd taken but it seemed that the 'big' money wasn't around, it may have been after the entrance ticket prices and souvenir programme, folk were being a little careful with their spending or it may be that with more of an art/illustration focus, the show had attracted a different crowd. 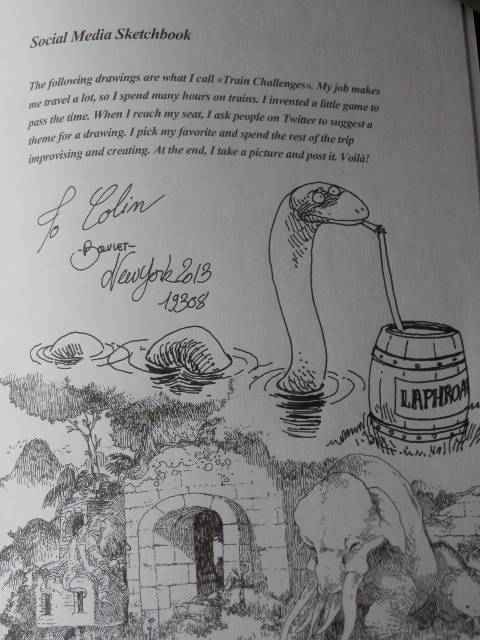 Of course it may simply be that folks didn't respond to our new books in the way that we'd hoped and the way they had in previous years? One further observation may be that the guests of honour hadn't set the heather on fire (as they say in Dundee! ), further discouraging the more general comic fans from attending, certainly it struck me a little odd that while the likes of Karen Berger, David Mazzucchelli and Paul Pope were in attendance (as judges for the new SoI awards), and others like Charles Burns, Jim Salicrup, Kim Deitch, (and no doubt others) were wandering around, I'd not seen any of them listed as guests in the pre-show advertising? 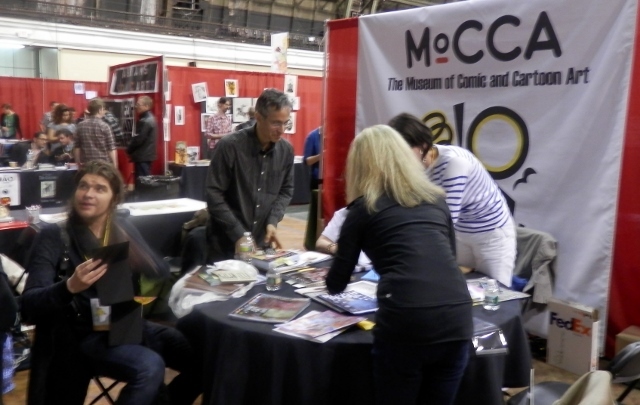 Paul Pope, David Mazzucchelli & Karen Berger get ready to judge! Both my favourite USA comic sites, The Beat and Comics Reporter were in attendance and have several reports on the show here and here, (and check out Secret Acres view) and while I (still) didn't get a chance to speak with Heidi or Tom, I did catch up again with Jimmy Aquino of Comic News Insider who is a great guy and supporter of all things British. A restrained MoCCA haul ! 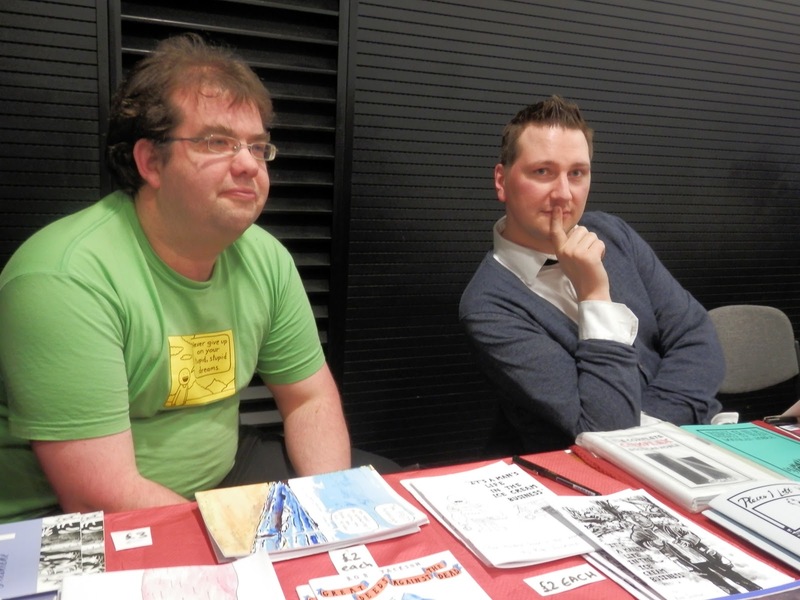 Completing our trilogy is Comiket, Paul Gravett, Peter Stansbury and Megan Donnelly's comic marketplace which accompanies their respected Comica festival. 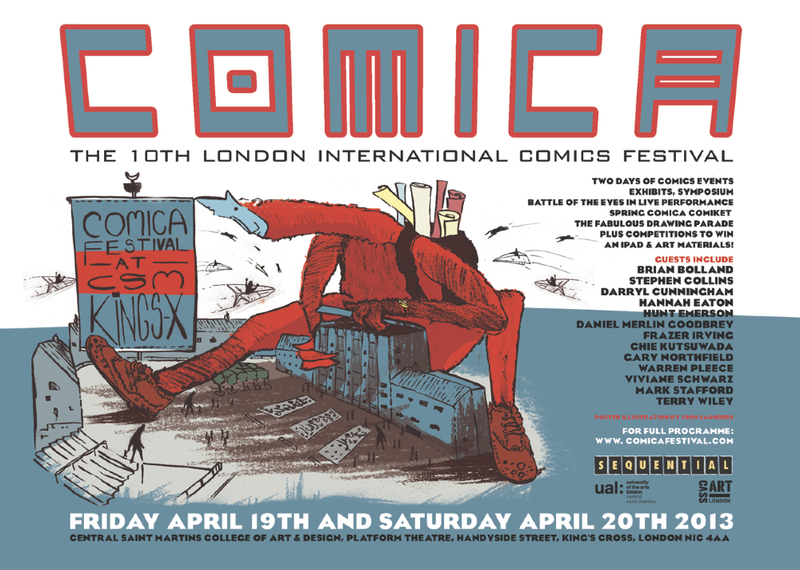 Like MoCCA, the festival is over 10 years, with the one day Comiket's now held twice a year, nicely bookending the UK season. We attended our first one 6 years ago and while always held in London, the venues frequently change with this one at Central St Martins College, being the 4th venue in 6 shows we've been to. We'd thankfully no hiccups in travelling and walked to the venue, behind Kings Cross station from Euston. The short walk in rare London sunshine was pleasant enough but finding the entrance to the College and show proved a little difficult, following the makeshift signs, round a few industrial corners then into the room behind the room. 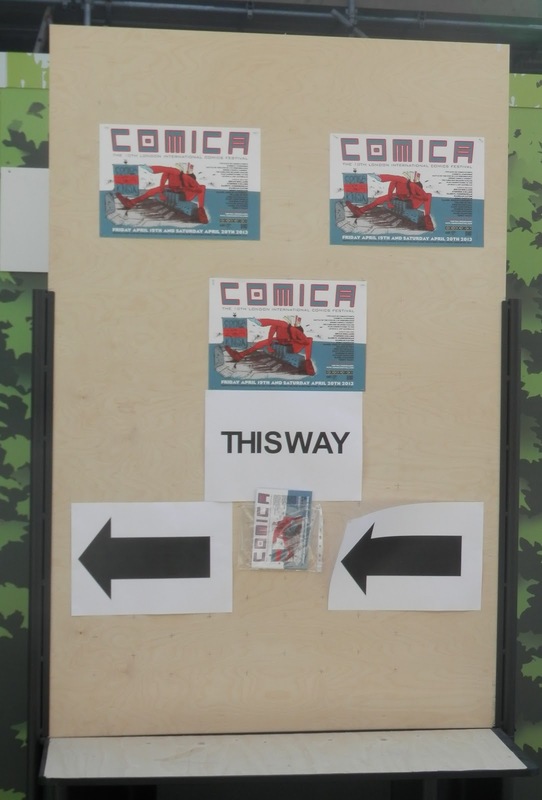 Being paranoid types, we and other exhibitors expressed concern whether this latest change in venue would be too far off the beaten track for even diehard comic fans to find and feared the worst. Sure enough the show started slowly, as most tend to, but we made a few early sales to keep us from worrying too much and gradually things improved as it got busier and busier, particularly after lunchtime, paradoxically just when the sunshine outside was at its best - what is it with comic fans and need to avoid sunshine or maybe Twilight has something to answer! 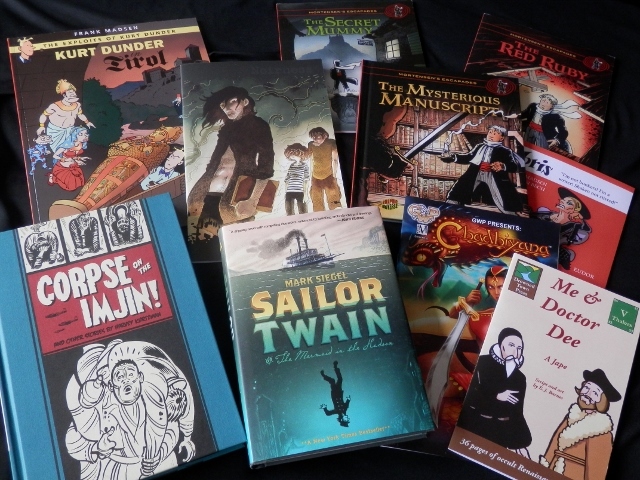 In any case we did pretty well in the end with several titles selling out and by the 7pm close we only had 5 books in total left - phew, our best ever Comica! It was nice being reunited with Dave behind the table as I've discovered he does have his uses after all and allowed me to have my customary little wanders round the halls, although typically I missed a good chunk of the show but did get to say hi to Dave O'Connell, our own Thaddeus Mist posse of Owen Johnson, Connor and Lizzie Boyle plus John Maybury, Darryl Cunningham (also a MoCCA attendee! ), Rob Jackson, Alex Finch, Joel Meadows (with whom I had a good chat and photo-shoot! 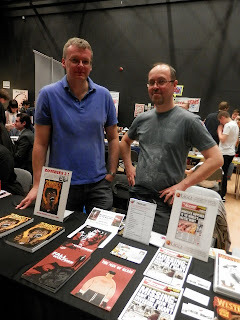 ), Orbital Comic's Camila, Doug Noble (fresh from his Dundee stint at the Accent UK table), and others, as well as meeting a couple of promising new creators with impressive work on display. 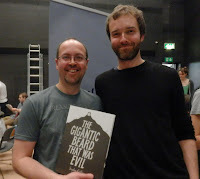 of the show about evil beards - gulp! The enigmatic Rob Jackson and Doug 'Dundee' Noble! 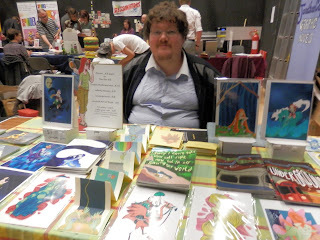 In a happy accident, our table neighbour was to be Cliodhna, fresh from MoCCA but unfortunately a runaway cat had caused her to miss the show and return to Ireland, leaving her able brother, Connla to run her stall on her behalf and a fine job he did too. 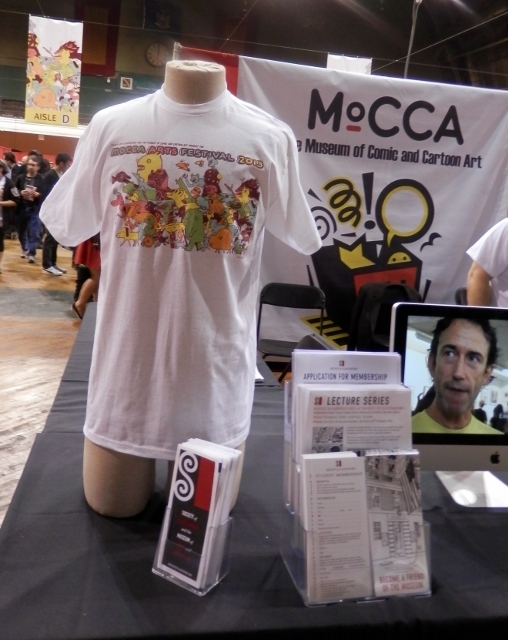 Speaking of fine jobs, the Comica crew really pulled it off, a great turnout in a new venue on one of the hottest days of the year. They've struck a winning formula with these shows, free entrance, varied selection of exhibitors and artists taking part in the live on stage drawing parade, with amongst many other indie folks a certain Frazer Irving doing a stint this time and the likes of Keiron Gillen, Jamie McKelvie and Rian Hughes casually walking the floor, soaking up the relaxed vibe. Well thanks for reading if you've made it this far in my longest ever post! All I can add is that each of the three shows were great fun to be part of with different experiences and a great diversity of comics and creators in attendance, reinforcing what a special time it is for comics at the moment. Would I recommend or return to the above shows? 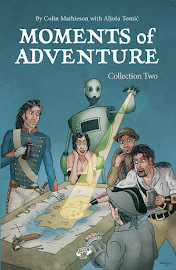 Certainly Dundee and London will be on our itinerary next time (assuming both shows return) and if these are easily travelled to from your home base, they are well worth going to. New York and MoCCA is sadly a little harder to justify, at least from a UK perspective. 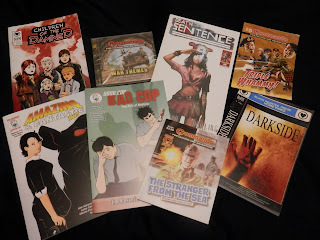 If you can combine it with a holiday and (like we do) whizz round a few comic stores to raise your profile, its worth a go but maybe not every year. 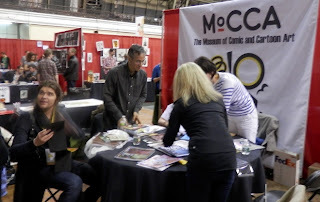 I would hate to think that we won't ever return to MoCCA, as its got the makings of a really special show, but we'd maybe have to tailor things a little and carefully review the costs involved, so we'll see. Is there a secret of running a successful show? I doubt anyone can really say for sure but being well organised, having a wide ranging appeal of guests, exhibitors and books can't harm, but the most important element has to be the public, without them there simply is no show. That's why free or cheap entrance fees are a must wherever possible to encourage the casual browser to step into this crazy world of ours! 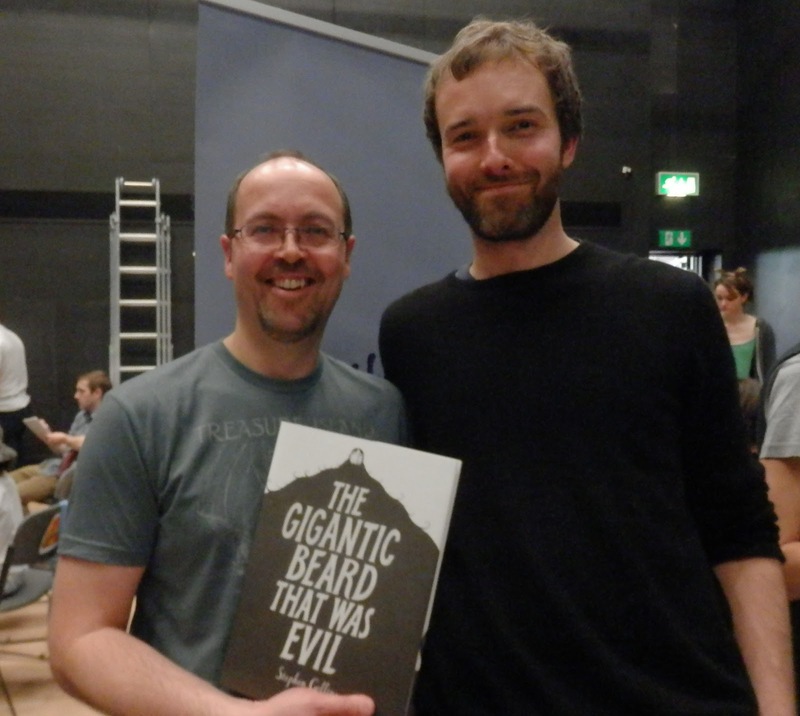 Finally a big thank you to the organisers and volunteers of the above (and all!) 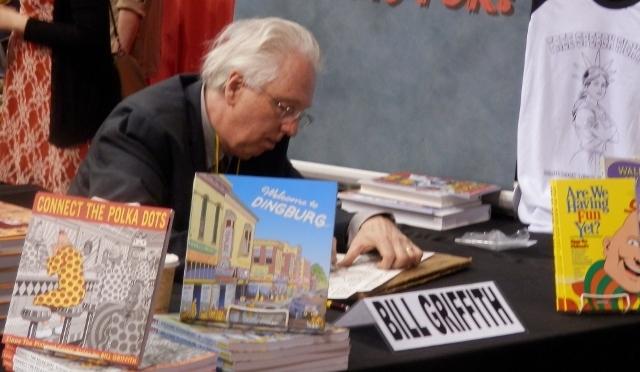 comic shows who put in a sterling efforts to make these special events happen, Cheers!